NOTE: This events calendar is from 2015. The guide to 2016 holiday events can be found HERE. Ready or not, here come the holidays! 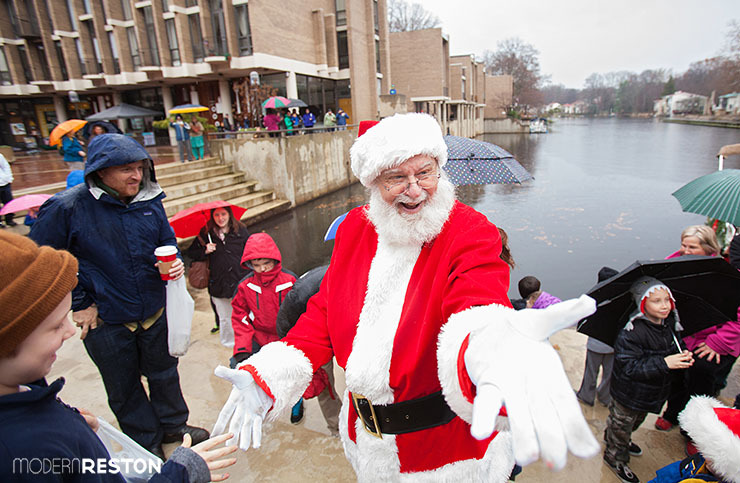 Here are some of the greatest celebrations of Thanksgiving, Christmas, Hanukkah, and Kwanzaa in Reston and the surrounding areas of Northern Virginia and Washington, D.C.
Santa will greet families at the Lake Anne waterfront on December 5, 2015. Tysons Corner Center will host their 2nd annual Tree Lighting, hosted by HGTV’s Alison Victoria, with a concert by American Idol’s Elliot Yamin. Santa and his reindeer will arrive after the concert. This 5K race winds around the beautiful Herndon Centennial Golf Course and on the W&OD Trail. Refreshments, entertainment and door prizes will be available after the race to all runners. Earn your Thanksgiving calories with this local Turkey Trot race. Choose 5K or 1 mile, and get the kids involved with the free Tot Trot. Race proceeds will go benefit Reston’s Embry Rucker Community Homeless Shelter and the South Lakes High School track and field team. Free, all ages welcome. Meet at the South Lakes Village Center at 8:30 a.m. to ride to Reston Town Center or organize your own neighborhood ride. All rides converge at Starbucks at Reston Town Center at 9 a.m. The Reston Holiday Parade will fill the streets of Reston Town Center on November 27, 2015. Run, run, as fast as you can! Kids can race the gingerbread man around the Town Center. Age divisions are available for toddlers through teens. Register online by Nov. 24. Enjoy a ride with the little ones through Reston Town Center in a train. Pick up is in front of Talbots on Market Street. Requested donation benefits Cornerstones charity. The evening celebration begins with a performance by the Reston Chorale and a brass quintet, followed by a holiday singalong and the dramatic arrival of Santa and Mrs. Claus to light the Christmas tree. Enjoy a ride through the lit streets of Reston Town Center in a horse-drawn carriage. $5 donation per person benefits a local charity (children 5 and under ride free). 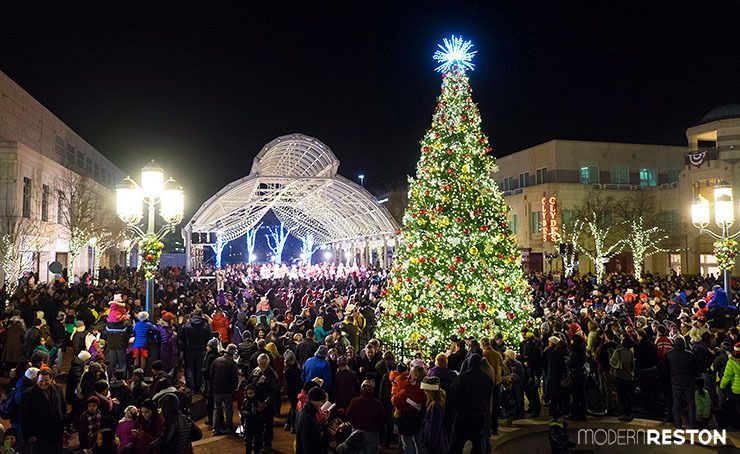 Reston Town Center’s annual Tree Lighting celebration takes place on November 27, 2015. Support small businesses by shopping for holiday gifts at the large variety of local businesses throughout Reston and the DC area. Church Street will be closed to traffic, and visitors are invited to stroll along the street amid the sights and sounds of the holiday season. Santa Claus greets children at the Freeman House. This retelling of the Christmas story from an Afro-centric perspective is infused with rich gospel, blues, funk, jazz, and dance with griot-style storytelling from an ensemble cast. $35, tickets available online. 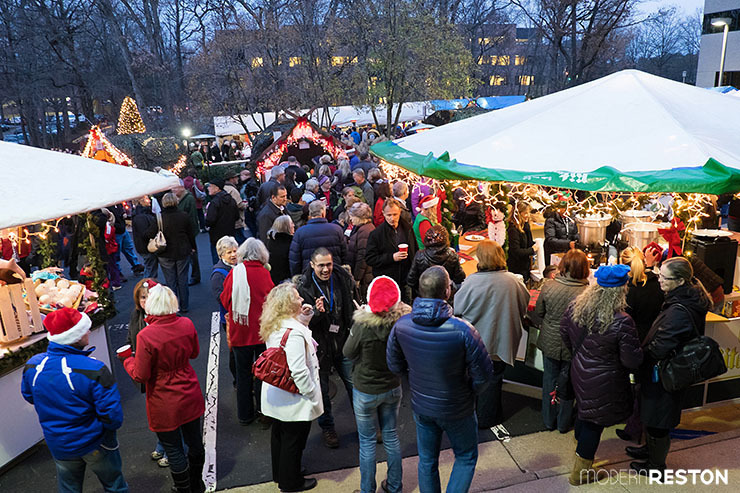 The German military hosts a popular Christkindlmarket each December, and donates all proceeds to charity. 5-9pm: National Zoo, Washington D.C.
BrewLights will take place during ZooLights, as a ticketed microbrew and craft beer event. Guests will enjoy beer tastings from a dozen breweries, as well as sample savory foods from top DC restaurants, all under the bright lights of DC’s favorite holiday tradition. All proceeds support the critical work of the National Zoo and the Smithsonian Conservation Biology Institute – including species preservation and animal care. $55, reserve online. The Hip Hop Nutcracker re-imagines Tchaikovsky’s classic score through explosive hip-hop choreography. A dozen all-star dancers, an on-stage DJ, and an electric violinist bring the traditional Nutcracker story to life in contemporary New York City. Meet the Reston artists whose work is in the museum’s holiday shop. Browse the handmade scarves, hats, glassware, ornaments, jewelry, pottery, and cards. Also available for sale will be a brand new beautifully illustrated book on Reston, martini glasses etched with Bob Simon’s signature, Reston sweatshirts, tee shirts, hats and more. Wine, soft drinks, cheese, and snacks will be served. FREE. 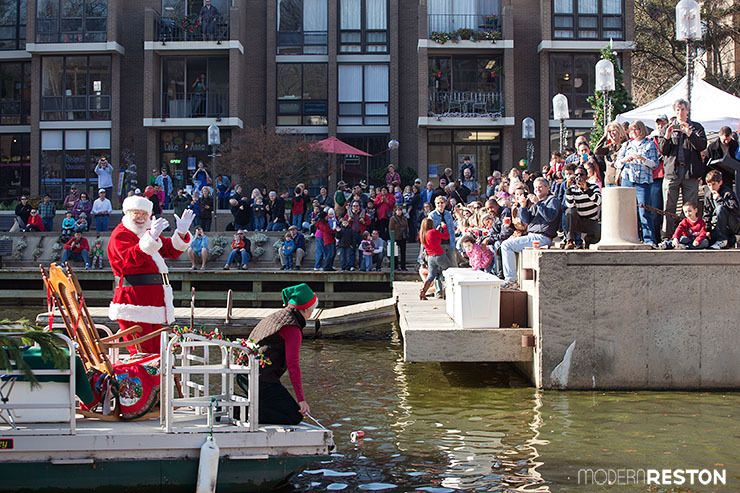 Santa arrives by boat to cheering crowds at Lake Anne on December 5, 2015. Sales of original artwork, including watercolor, oil, acrylic, clay, mixed media, photography, and fiber, will benefit Cornerstones. Support several local charities and people in need by contributing your holiday shopping time and money to this alternative gift market. Tour Herndon homes that are beautifully decorated for the holidays. Get started on your holiday decorating by making festive wreaths for your home. Listen to seasonal music and enjoy mulled cider and cookies. All supplies provided. $20/$25 per wreath. Reserve in advance. Enjoy marching units filled with the magnificent tartans of Scottish Clans, the stirring sound of Scottish bagpipes and drums, Scottish dancers, reenactment groups, Scottie dogs, dignitaries, classic cars, and Santa Claus. FREE. Bring your dog to the newly opened PetMAC, and give him a chance to ask Santa for Greenies and tennis balls. This free annual musical celebration hosts a performance by the United States Marine Band and a sing-along of Christmas carols and Hanukkah songs with choir and vocal groups from the metropolitan Washington area. Celebrate the holidays with beloved carols and customs from around the globe, plus Daniel Pinkham’s Christmas Cantata for brass and organ. Carols, tree lighting, and a visit from Santa. Alexandria’s harbor lights up as dozens of illuminated boats cruise the Potomac River at the historic waterfront, led by Alexandria’s fireboat The Vigilant, and Washington DC’s fireboat John Glenn. Wear your most festive holiday costume as you run, and bring your kids for the free kids fun run. Register online. 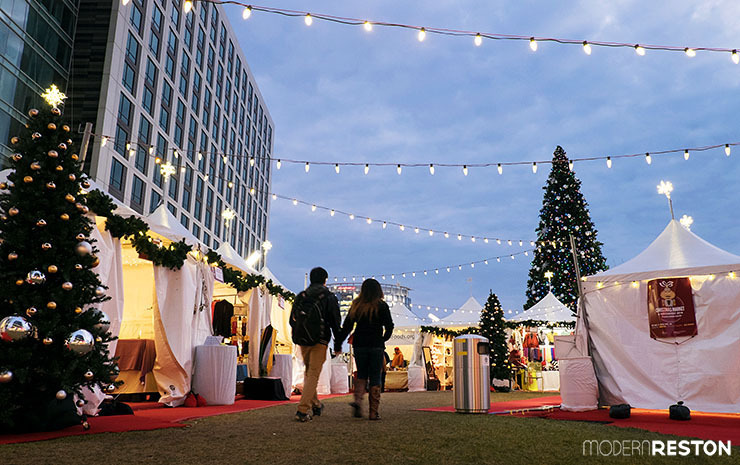 More than 100 vendors will offer unique gifts, holiday decorations, and handmade items. Enjoy a special holiday visit and take a wagon ride with Santa through the woods and fields.Activities include a holiday craft, cookie decorating and puppet show. Register in advance. Tour Reston’s nature center while enjoying holiday refreshments, crafts, live music, and a family sing-along. Meet artist Dana Scheurer and photographer/author Don Chernoff. This annual celebration features musical performances, community groups, and the arrival of Santa on an antique fire truck. FREE. 4pm: National Eclipse, Washington D.C. The giant National Menorah will be lit, along with musical performances, latkes, donuts, and dreidels. Tickets are FREE, but must be reserved in advance. Celebrate with a bonfire, petting zoo, pony rides, and live nativity scene. Santa and Mrs. Claus will arrive at 5pm on an antique fire truck to light the Christmas tree. FREE. 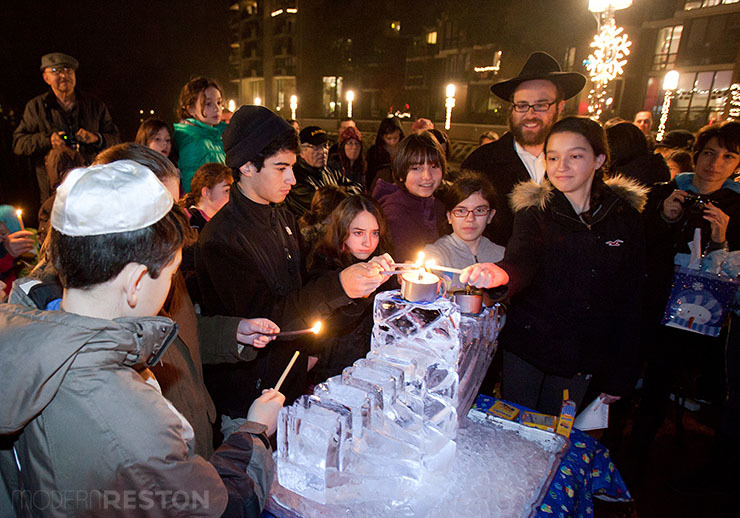 Celebrate Chanukah with a menorah lighting, latkes, and dreidels at Lake Anne on December 8, 2015. A community Menorah will be lit at the waterfront, and then there will be a party in the community center with latkes, donuts, chocolate gelt, dreidels, and musical performances. FREE. Create a beautiful seasonal decoration, with many options for you to choose from, and an instructor to guide you along the way. $22/$32. Reserve in advance. Join Artistic Director David B. Lang, Associate Director Allan Laino and a talented quartet of guest soloists in singing the glorious Christmas portion of Handel’s masterpiece. Meet photographer Jim Kirby, whose work has been featured in 20 years of “At Home in Herndon” town calendars. The exhibit will be on display Dec 8-Jan 17. FREE. Rummage up the Ugliest Sweater you can find and celebrate the Holidays by participating in the Merriest 5K of the year. Register online. 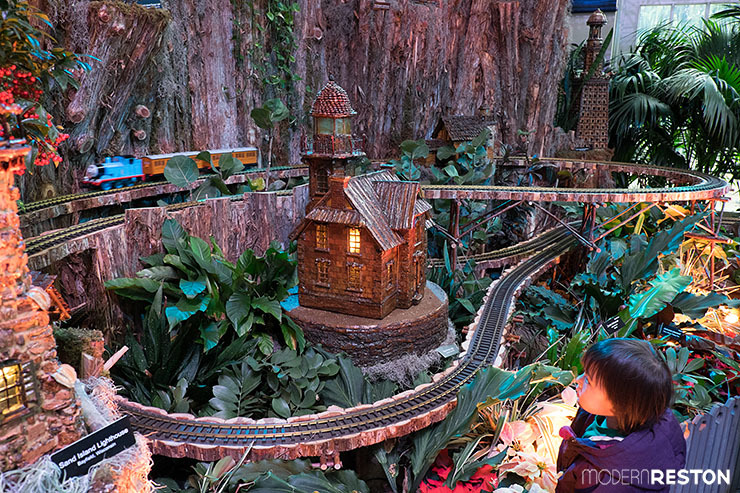 Model Train enthusiasts of all ages will enjoy this holiday-themed train show. The W&OD caboose and Herndon Depot Museum will also be open for tours. FREE. Bring your child to enjoy holiday fun. Cost includes kiddie open gym, craft projects, a visit with Santa and a reading of a holiday story by a special guest. $9 per child. Train rides, crafts, campfires, and holiday decorations add to the fun when kids meet and greet Santa at Lake Fairfax Park. $10 each, register online. This musical celebration includes performances by the Children’s Chorus of Washington and the American Youth Philharmonic Brass Ensemble, as well as a kids-only singalong. Tickets are $25 for adults, $15 for kids, or $75 for a family 4-pack. Welcome the holiday season with Dance Place’s annual Kwanzaa Celebration. Gather family and friends to join Coyaba Academy, Coyaba Dance Theater and special guests celebrate the seven principles of Kwanzaa. Visit Santa in the mill and see the Christmas tree trimmed with Victorian decorations. Join the costumed 49th Virginia Volunteer Infantry caroling around a bonfire while roasting marshmallows. $5 per person. The church at Lake Anne Plaza will offer a choir concert and reception. A holiday treat for even the littlest fan, this one-hour, highly participatory concert delights with songs of Santa, Frosty the Snowman, and Rudolph the Red-Nosed Reindeer. Recommended for children ages 5 and older. This Chanukah celebration includes ice skating, hot latkes and donuts, dreidels and chocolate gelt, and a grand Menorah lighting. Admission is FREE, skate rental is $12. US Marines will be on site accepting unwrapped toys and cash donations, and helping children’s dreams come true. An evening bike ride to view some of Reston’s best holiday lights, approximately 10 miles. Riders are required to have a front light and red, rear light. Helmet strongly recommended and required if under 15 years old. FREE, but reserve in advance. Musical works of the season by Rutter, Wilberg, Handel, Mozart, Faure, Susa, Willcocks, Hobby, Rudolph, and more. A reception will follow the concert. FREE, but a donation is requested to benefit Cornerstones. Bring your holiday guests and join master puppeteer Bob Brown in a holiday production of Winter Wonderland. Join the lively marionettes as they frolic in a magical winter wonderland of snow. After the show, stroll the Park and visit our animals or shop at the Country Store. Register in advance. Spend Christmas Eve at Alexandria’s waterfront for a spectacular show by the Waterskiing Santa and his wakeboarding reindeer, plus flying elves, the Grinch and his friends, Frosty the Snowman, and Jack Frost. Dress like a holiday weirdo and get your dance on with DJ John Coulter, a Modern Reston favorite. 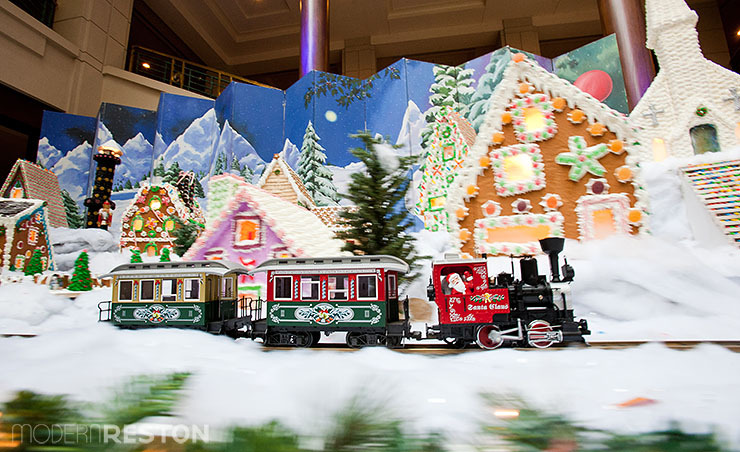 The lobby of the Reston Town Center Hyatt will host a tremendous gingerbread village throughout December. Between Market Street and Democracy Drive (across from Starbucks) Come and enjoy holiday songs outside at the Reston Town Center South Market Promenade, by a variety of community performers. Departs on Market Street in front of Talbots. Children under 5 ride free. All proceeds benefit local charities. Children’s train departs in front of Talbots on Market Street. Donated proceeds benefit local charities. The outdoor Tysons Corner Plaza will host a Christmas market and ice rink throughout December. Stay warm in your car as you drive through 2.5 miles of beautiful light shows. The driving tour ends at a winter carnival, with rides, bonfires, crafts, and animals. This Christmas tree, Menorah, and festival opposite the White House is a beloved annual tradition. The National Christmas tree is surrounded by the Christmas Pathway of Peace, a ring of decorated trees that represent each U.S. state and territory. In this spectacular annual ice show, Santa is brought to life in more than two million pounds of colorful ice. Walk through this classic Christmas story, slide down ice slides, and watch the artisans as they create these frozen marvels. More than 500,000 LED lights that transform the National Zoo into a winter wonderland, including a dazzling light show set to music. FREE. See local landmarks and holiday scenes constructed out of plant-based materials at the U.S. Botanic Garden’s Season’s Greenings. Set in 1882 Georgetown, this gorgeous production showcases the grandeur of The Washington Ballet’s international roster of dancers and majesty of Tchaikovsky’s music. Replete with swirling snowflakes, cherry blossoms and historical characters, including George Washington as the heroic nutcracker, TWB’s The Nutcracker has become a tradition for generations of family and friends to celebrate the holidays. Reston’s Conservatory Ballet makes holiday magic come to life with its 43rd annual production of The Nutcracker. Young dancers from the Reston area will perform this Christmas classic. Join the ghosts of Christmas Past, Present and Future as they lead the miserly Ebenezer Scrooge on a journey of transformation and redemption. Originally conceived by Michael Baron, this music-infused production captures the magic and joy of Dickens’s Yuletide classic. DC’s internationally-known percussive dance company invites you to celebrate the holidays with clapping, stomping and all around fun for all ages featuring their furry friends from the Animal Kingdom, and a special dance party with DJ Frosty the Snowman! The hit Broadway and Tony Award-nominated musical inspired by the acclaimed children’s books, Frog and Toad, is a holiday classic. Two best friends with completely opposite personalities wake up from hibernation, and enjoy hilarious and heartwarming adventures through the seasons. What are your favorite holiday events in the Reston area? Did we miss any great ones? Let us know in the comments! A Hanukkah Latke Vodka Party: Get Lit While Lighting the Candles! Share in the magic of Narnia this weekend, 12/3 – 12/6. Herndon HS Theatre presents “The Lion, The Witch and The Wardrobe” on Thursday, Friday, Saturday at 7:30 pm and Sunday at 2 pm. This family-friendly show has excitement for all ages. Tickets are $12 with a pay what you can performance on Thursday night.